Linking you directly to the HVAC product or information you are searching for online. Why sift through sites? Use our direct links for all your HVACR needs online! You can find it fast with HVACASAP.com. HVACASAP.com is developed by advocates helping those who want to make a career in the HVACR industry. hepa:(abbr. for High Efficiency Particulate Arrestance) Term for an air filter that must remove 99.97% of contaminant particles 0.3 microns or greater that pass through it. A HEPA filter is highly effective for trapping airborne dust, dirt, dust mites, dander, and other contaminates. blower relay:An electrical switch that powers the fan (blower). This is usually controlled by the thermostat, control board or fan/limit control. ladder diagram:Schematic diagram showing the logical flow of electrical current. Most ladder diagrams for HVAC systems can be found on the access door of an indoor air handler or furnace and outdoor condensing unit. hspf rating:Heating Seasonal Performance Factor is an efficiency rating for a heat pump system. This can be a geothermal or air-source heat pump system. HSPF can be calculated by taking the total heat output in BTUs, dividing it by the total kilowatt hours of electricity it uses in an average season and rounding it down by one thousand. For example: If a heat pump puts out a total of 180,000,000 BTUs and it runs a total of 16,800 kWh per heating season, it would have a HSPF rating of 10.7 (180000000 / 16800 = 10741 / 1000). Currently, the U.S. Department of Energy's minimum efficiency standard for heat pumps is 8.2 HSPF. compressor:In HVAC terms, a compressor is an oil-filled, mechanical device that takes low-pressure, refrigerant vapor and compresses (condenses) it into a smaller volume which becomes a high pressure liquid. Most compressors are hermetically sealed which means its components are self-contained and are not accessible. Semi-hermetic compressors can be compared to vehicle motors and its internal components can be replaced or repaired. Semi-hermetic compressors are found in commercial and industrial applications requiring very large HVAC systems to condition an area. manual j:Type of manual or computerized calculation to determine residential heat loss or gain (load) depending on the type of HVAC equipment being sized for the enclosed and entire conditioned space. Many factors dictate a final load calculation including, but not limited to; R-values of insulation and building materials, windows, and doors. condensate pump:A device used to pump condensation drained from the evaporator (indoor) coil to be disbursed elsewhere. Condensate pumps are usually found with systems that have no direct drainage. air change:The volume of air required to completely (100%) change the current volume of air in any enclosed area in a certain time frame. This can be calculated in minutes or hours depending on the size of the area. This calculation is used to measure air velocities and sizes for ducting, fans, fresh air intakes, air exchangers, and exhausts. vav systems:Variable air volume systems control the amount of air flow and temperature to the area it supplies. Unlike a single thermostat that controls a single system, VAVs have a separate temperature control for each zoned area. multimeter:A tool used for measuring electrical voltage, ampere, resistance and continuity. Some meters include readings for temperature, microamps and capacitance. You can get your HVAC information online here faster. This web page focuses on general heating, ventilation, and air conditioning components and systems. 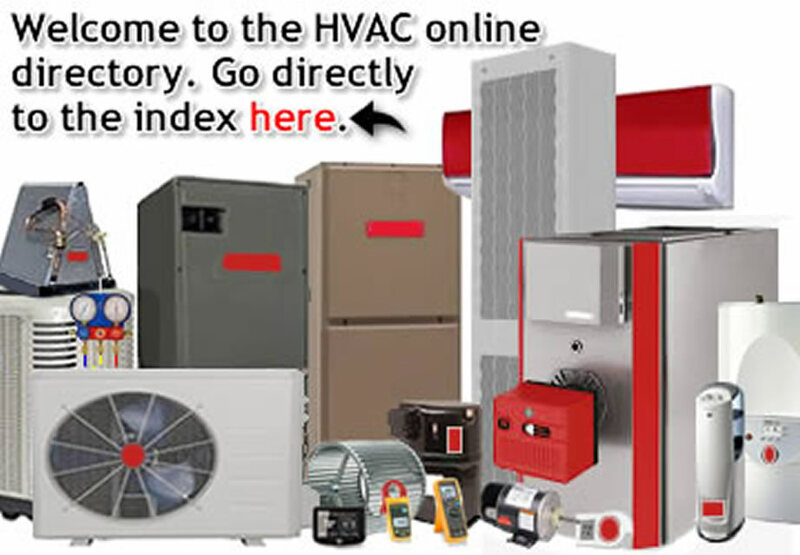 This directory, and its referenced sites, was developed for the technician, business owner, engineer, and homeowner to assist in finding or researching a HVAC-related product. Our web pages are ever-changing to meet the demands of our visitors. Please contact us if this HVAC online reference directory does not provide the information you are looking for.